Image caption Will 2018's stunning summer, a weak pound and uncertainty tempt people to Wales? Holidaymakers look set to embrace staycations in Wales this year as Brexit sparks nervousness about European holidays, tourism chiefs say. The Easter holidays were due to be the first break after Britain left the European Union, before the government delayed the initial 29 March deadline. Tourism bosses say the weak pound and uncertainty could add to the 10 million annual overnight trips to Wales. The Wales Tourism Alliance is positive there will be a "Brexit bounce". Will Brexit be a boon for tourists? The drop in the value of the pound has made foreign holidays more expensive and many operators in Wales are reporting greater interest as 2019's holiday season begins at the Easter break. 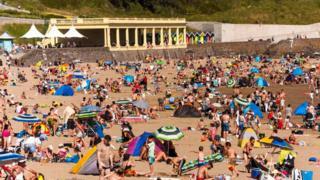 About 90% of overnight trippers to Wales are from the UK staycation market and that could rise with a scorching summer similar to last year. "People are understandably nervous about going to Europe," said Andrew Campbell, chairman of the Wales Tourism Alliance. "There is also a lot of uncertainty and people are holding on to their cash." The alliance, which represents more than 7,000 businesses, spoke to delegates in Pembrokeshire on Friday about the "opportunities" for Welsh tourism because of Brexit. "Since the decision was made to leave the EU, the tourism industry has benefited," said Pembrokeshire Tourism liaison manager Dennis O'Conner. "We have received lots of international visitors because the pound is so low and more and more people are looking at staycations." One holiday letting company, FBM Holidays, which has 300 properties across west Wales, is preparing for its busiest year for three years, while the 350-cottage Bluestone resort is already ahead of its 2018 summer occupancy rate with three months remaining. The Caravan Club in Wales, as well as across the rest of the UK, has recorded its best quarter in a decade while bookings at Mark Whitehouse's holiday park in Fishguard is up 25% for this summer. "It has given us a small window of opportunity to introduce new customers to UK tourism," he said. "The hysteria will settle down and people will start going abroad again but hopefully we will retain a proportion of them." There is also a feeling in the industry that some holidaymakers are waiting to see the impact of Brexit before booking their summer break. "People are holding their breath to see if there is going to be any impact on their income before they book their holidays," said Pembrokeshire Tourism chair Jane Rees-Baynes, who runs Elm Grove Country House near Tenby. "People maybe waiting to see if they need to worry about passport queues and things like car insurance on the continent. It will be a lot more last minute this year." Video How do you avoid holiday traffic jams?